Sometimes, even famous Renaissance artists don't always get their paintings perfect. What in Raphael's Sistine Madonna is not quite right? Regular readers of this blog know that I mistrust winged babies. They are always up to some sort of chicanery. Here are those incorrigible cherubs. Ask them. They know the answer. The first person to answer correctly will win Philppa Gregory's The White Queen. Just leave your answer in the comment field below. If no one guesses the correct answer then a winner will be selected on "best creative answer." Contest ends this Saturday. Hints will follow tomorrow if no one guesses it today. My husband gave me this book as a mother's day gift not realizing that I already had read it. I think The White Queen was her best yet. It's one of those quick reads. It covers Elizabeth Woodville. But if you like that era in history, I also recommend The Stolen Crown: The Secret Marriage that Forever Changed the Fate of England by Susan Higginbotham. The look of horror on the faces of the Madonna and Christ child are not quite right. This picture was first hung in the Sistine Chapel across from the alter Crucifix, and the mother and child are staring at death with this look ofr extreme distain and horror. What a cool contest! I'm not going to enter because I already own The White Queen (great book!). The faces of Christ and His Mother are looks of terror and disdain. The most likely reason is because this painting first hung in the Sistine Chapel across from the crucifix and Christ and Madonna are seeing the future and accepting death. 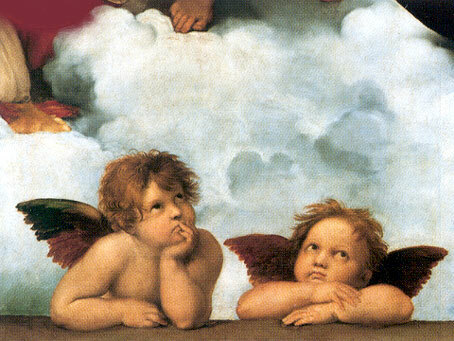 But I have to say I do not care for the creepy cherubs either and to me they seem like they don't care at all. Sure there's a crucifix across from them but what do they care? They're cherubs! Dubious little things, if you ask me. 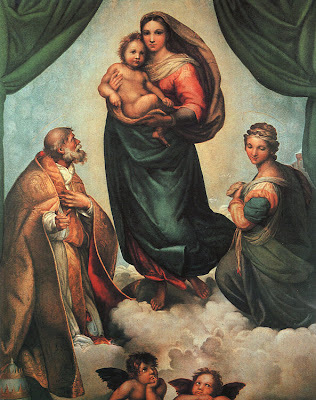 The Madonna and baby Jesus look terrified but no one has ever figured out why he painted them that way. Thanks for the giveaway!! I'm thinking that pope or saint on the left has one too many fingers, myself. Unless he was related to Anne Boleyn? I can't qualify due to not being from USA but here is my guess just for the kicks - the Virgin's toe is very short and unproportional to other fingers on her feet. Cherubs are just a red harring as the toe in question is visible in the second image. Oh, it must be that 3rd finger on the man! Many times artist's would include the patron's namesake Saint in the picture as a way to represent them. I'm sorry, terrible grammar, horrible spelling, and incomplete information- but I had to try! Personally my observations are not as astute as your other clever readers. I can't help but think that I am disturbed by the fact that the little imps, I mean angels are looking straight up the blessed Mother's skirts. I must also add that the Madonna's feet strike me as being wrong somehow. I want to wrap her feet in socks to hide their freakishness. PS upon further examination I think that the cherubs heads have been painted over. It almost looks like they were cut and pasted over. Just a thought, thanks for such a fun contest and an amazing blog. The man definitely has six fingers on his right hand.